What is Oxidative Stress and Why Is it a Problem? This ubiquitous term is often closely followed by the word “antioxidant”, but what exactly is Oxidative Stress? Oxidative stress is a type of stress that we cannot see, as it affects the cells deep inside our bodies. It causes damage, more specifically, damage to the mitochondria, which are the power houses of each cell, thus affecting the amount of energy they produce and need to function. With this loss of function comes less efficient performance and ageing, manifesting itself as fatigue, poor skin health, depression, IBS and much more. Choose foods that have no ingredients list, in other words, cook from scratch from basic raw foods as far as possible. This will minimize the chemicals and sugar you consume. Add colour to every meal! The more rich and colourful a fruit or vegetable, the more antioxidants you will be consuming. These antioxidants will “eat up” the damaging free radicals produced as a result of oxidative stress. You’re aiming for 7-a-day! Good quality SLEEP; this is when your body rests and repairs; reversing the effects of oxidative stress and ensuring that it is ready for a productive and efficient day ahead. Focus on a regular bedtime routine avoiding stimulants such as caffeine or white light from phones or screens. Nutri-ful! Nugget: Your body is incredible and can adapt to meet its demands. The more support you can give it, the more it can recover and meet your health goals. Take Control of your Health…. 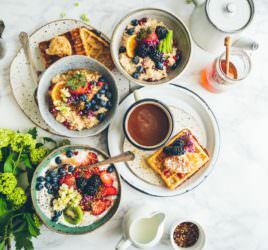 By attending a one-to-one Nutritional Therapy consultation, I will be able to link your current diet choices and lifestyle to any symptoms and provide a sound understanding of your nutritional requirements. I will then discuss a specific protocol to help you achieve your health goals, which will include diet/lifestyle recommendations and if necessary, supplement advice and nutritional tests. I can recommend tests to check for vitamin and mineral deficiencies, stress levels, hormone imbalances, food allergy/intolerances and how well you digest and absorb your food. The tests I offer are often more comprehensive than the standard tests offered by your GP and I will provide full interpretation.